Since the late 1960s it has been a popular cafe. It has been part of the street scene on Charlotte Street in Fitzrovia since the late 1960s but it will serve its last all day breakfast at the end of the week. Despite the cheery smiles behind the counter the owner and the staff are reluctant to tear themselves away from the street and its loyal customers. 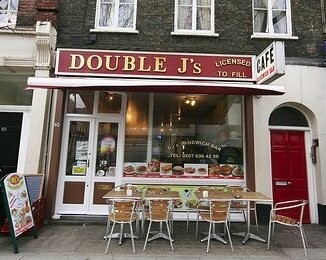 Loved by many of the locals and workers in Fitzrovia, Double J's cafe often has to turn customers away because there is so much demand for its inexpensive breakfasts and lunches. But on Friday it will serve its last customers. 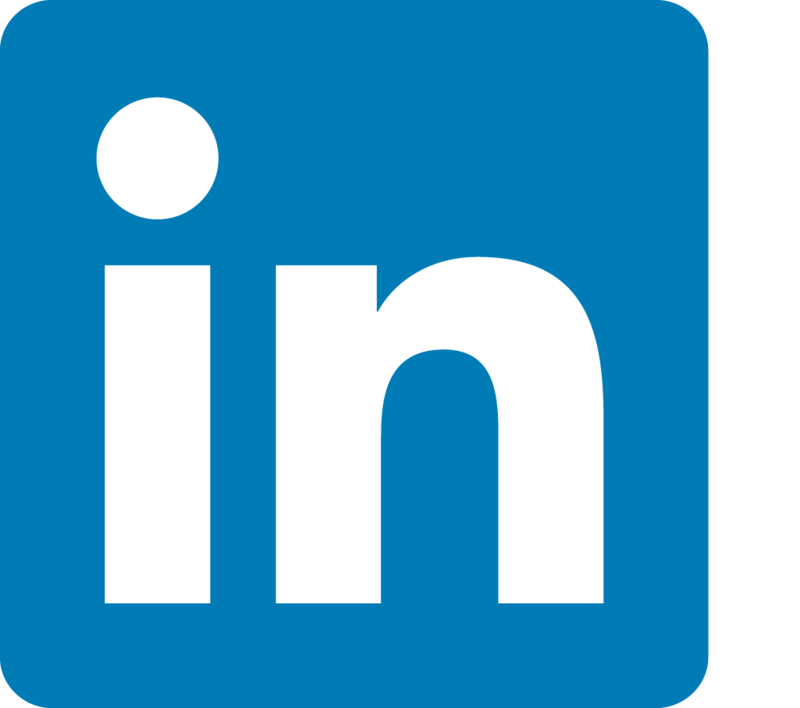 Its owner Mustafa Maslak started life in the catering business at age 14 in a bakery in Kayseri in Turkey. He then worked in an Istanbul restaurant before moving to London. He worked in a restaurant in Hackney then had his own business in Tottenham. For the last three years he’s been at Double J’s a shop he took over from another Turkish man. Now the owners of the building want to redevelop the shop units and there’s no room for Mustafa and his well-loved cafe in the plans. He’s hoping to find new premises in Fitzrovia to continue the cafe with its famous breakfasts and snacks and keep his customers well-fed and happy. But so far he’s not managed to close a deal before he has to leave at the end of the week. “What can you do?” he says with a smile. Most people would be fed up and miserable. But Mustafa is an optimist and determined to find another premises in Fitzrovia. All smiles but nowhere to go. 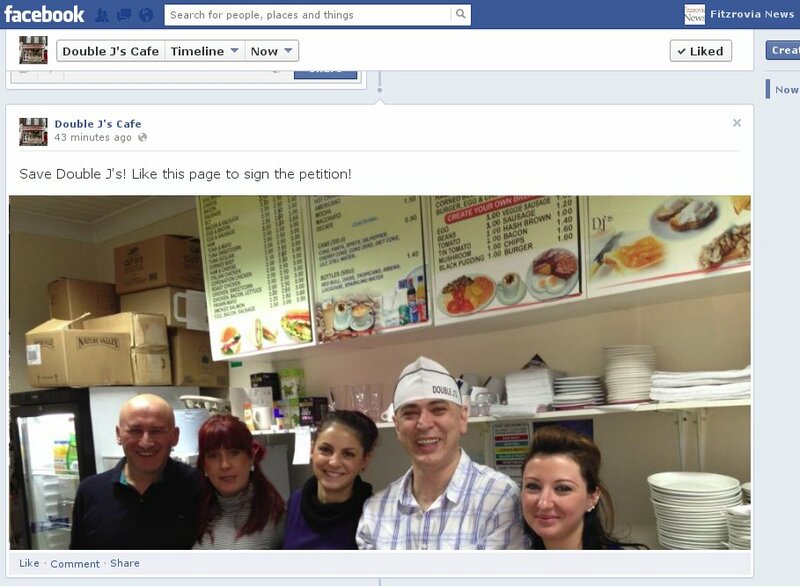 Lisa (second from the left) has started a campaign with a Facebook Page to find new premises. Owner Mustafa (in the hat) started out in a bakery age 14 in Turkey. Lisa who has worked on and off in the cafe for the last five years has started a Facebook page to “Save Double J’s“. She tells Fitzrovia News that she wants to draw attention for the need for new premises to carry on the cafe. “You’ve got to do something” she tells us in between serving a steady stream of customers. The new owners of the building want to knock three shop units and the basements into one to create an upmarket food market and restaurant. Out goes Double J’s and so does the neighbouring hair salon. In its place, according to the marketing people and planning consultants, will be the Charlotte Street Market, covering two floors and three shopfronts if they get planning permission from Camden Council. Fitzrovia in the last few years has been hit by a curse of developers. Its driven out people who have lived here all their lives and it threatens the character of the area and its hotch-potch of little shops and cafes which many say is unique in central London. Crossrail, the threat of HS2, speculative property investment, and the new Business Improvement District is forcing up the price of property and changing the neighbourhood. Even the big guys on the street are leaving. Saatchi & Saatchi up the road from Double J’s are also having to move as Derwent London’s plans for the redevelopment of the office block will get underway in the spring of 2013. Others leaving in 2013 include Sakely’s cafe on the corner of Charlotte and Tottenham Streets and Mateo’s cafe in Tottenham Street. The Little Greek Pie shop on the corner of Tottenham Street and Cleveland Street shut some months ago because of the disruptions caused by the Fitzroy Place development. 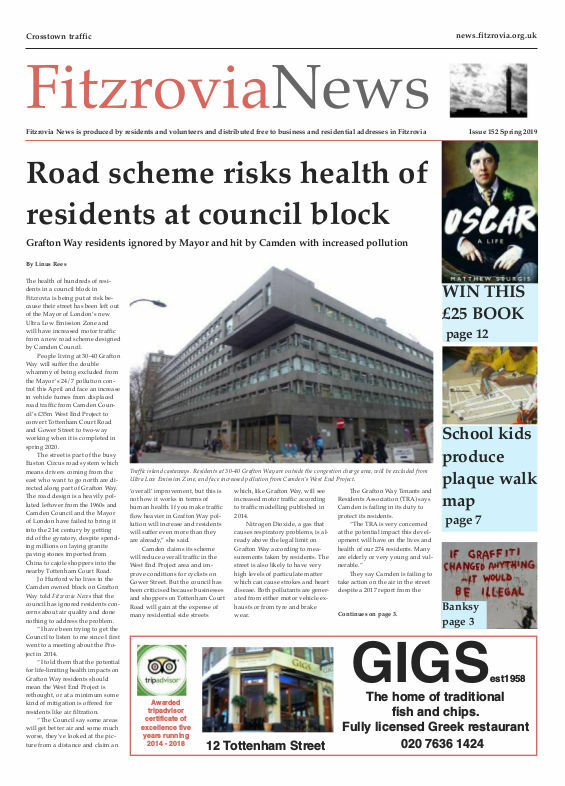 And these will be followed by Fitzrovia News as the Fitzrovia Neighbourhood Association is also leaving its premises. old part of Rome – so the houses in and around Charlote St. may not be soo magnificent as the ones in Rome, nevertheless they are a part of our history. Unfortunately money talks louder than all of our protests.